This universal, one size fits all elbow support brace has been designed for anyone who suffers from Epicondylitis, more commonly known as tennis or golfer's elbow. 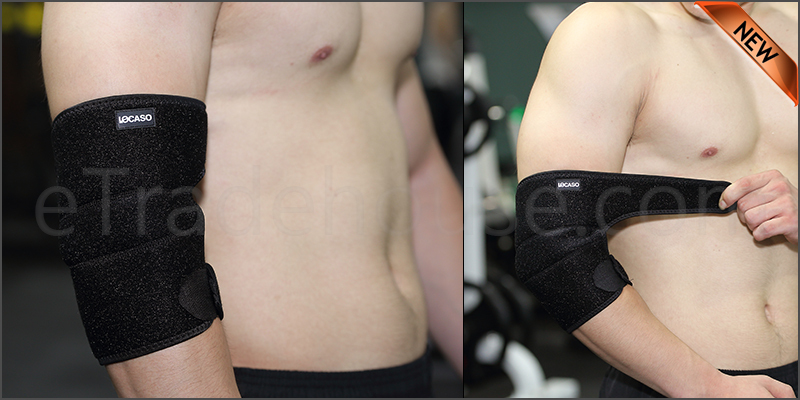 These soft elbow brace are comfortable to wear, effectively reduces the pain. Fastest relief to the inflamed muscles and tendon. It prevents muscle fatigue and strain, improves blood Circulation. It's also suitable for and other sprains and repetitive strain injuries. It works by supporting injured, weak or arthritic elbows whilst you play sport or carry out exercise. Adjustable firm support for left or right arm. The band is flexible and durable made of high grade neoprene and high quality nylon stretch for a custom fit. The Fastner straps are good and strong can be adjusted to fit a wide arm circumference. Suitable for daily activities and various sporting activities such as golfing, tennis, weight lifting, rock climbing etc.